For info on the epic prizes for this event click here. • Only the 16 players qualified for the WC2013 Grand Finals (listed above) may take part in this event. • Players must check in 1 hour before the start of the event. You will have up until 1 minute before the event starts to check in, otherwise you will be dropped from the event. • We recommend playing on PC as it has the most stability. In the case of a sync error, the game will be replayed unless it was clear that one player was dead (for example, the game freezes with one hero at 0 health). Again, playing on PC should avoid this particular issue. • In the case of a disconnection, the player that disconnects will get a game loss unless it was clear that one player was dead (for example, the turn player drops when he is about to attack to reduce the opposing hero to 0 health). • Send in your deck list to Mojumbo at least 5 hours before the event begins. We will be randomly checking gamelogs to make sure players aren’t trying to change their deck mid-tournament. • Your deck list for day 1 does not have to match your deck list for day 2. • Only the 16 players qualified for the WC2013 Grand Finals (listed above) may take part in this event. • Players must check in 1 hour before the start of the event. You will have up until 1 minute before the event starts to check in, otherwise you will be dropped from the event. • The playoff will be arranged at a time that works for both the players that qualified for it. • If the winner of Day 1 and Day 2 is the same person, they will be crowned the World Champion on the spot and the Epic bo7 playoff will not be needed. • The playoff will be a bo7 match with a 10 card sideboard (deck lock). • Alternate who goes first each game up to game 6. Determine who goes first in game 7 randomly. • Send in your deck list to Mojumbo at least 1 hour before the playoff begins. We will be randomly checking gamelogs to make sure players aren’t trying to change their deck mid-playoff. • Your deck list for the playoff does not have to match your decklists for day 1 or 2. Last edited by Mojumbo; 11-22-2013 at 08:22 AM. A double-elimination tournament is a type of elimination tournament competition in which a participant ceases to be eligible to win the tournament's championship upon having lost two matches. It stands in contrast to a single-elimination tournament, in which only one defeat results in elimination. For more information about double elimination tournaments click here (external link). A sideboard is a separate stack of cards that you use to modify your Main Deck in a match. In game 1 of each round, you must use your Main Deck and no cards from the Sideboard. You can only bring in cards from your Sideboard in the 2nd game onwards. Note that your deck must stay the same size, so you can only be replacing cards. For example, you might decide to side out Smashing Blow for Crippling Blow because your opponent is running few items and many allies. Remember though, you must always side out cards after you finish your round! It is illegal to have sideboard cards in your Main Deck for game 1 of the next round. We will be checking and reminding players to make sure they have sided out their cards between rounds. If you are found to have Sideboard cards in your deck during game 1, you will be given a game loss. Last edited by Mojumbo; 11-20-2013 at 09:15 PM. Suggestion: IMHO, let's not have a 'may'. It's better to state all rules clearly now; ask all the questions to be asked and seal the rules. IMHO, if a player enters a game with less/more than the original number of cards submitted to TOs before the start of finals, auto loss for that game. The same for flouting the sideboard rules, I.e deck must be in original state in all game 1s, auto dq for that game if decklist was edited/different. These top 16 players are proven tenacious players with indomitable will and high level skills and intelligence: if they are careless or stupid enough not to follow simple rules, they deserve to lose that said game. A sideboard is a separate stack of cards that you use to modify your Main Deck in a match. In game 1 of each round, you must use your Main Deck and no cards from the Sideboard. You can only bring in cards from your Sideboard in the 2nd game onwards. Note that your deck must stay the same size, so you can only be replacing cards. 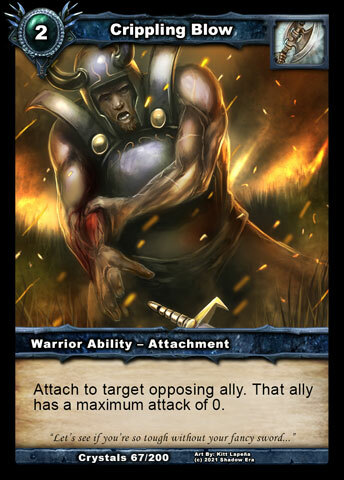 For example, you might decide to side out Smashing Blow for Crippling Blow because your opponent is running few items and many allies. Remember though, you must always side out cards after you finish your round! It is illegal to have sideboard cards in your Main Deck for game 1 of the next round. We will be checking and reminding players to make sure they have sided out their cards between rounds. If you are found to have Sideboard cards in your deck during game 1, you may be given a game loss. "Try and try until you die...or succeed...whichever comes first"
Is it normal to announce brackets before decks are submitted? ? And even beforr the last qualifier happened? Sorry double post, second question. There's no way to stop people joining without invite so Mojumbo made a placeholder. The brackets will get shuffled on the day.